Forensic Assurance Proficiency Tests are available for purchase by interested parties. Only the results of tests taken by qualified forensic practitioners/examiners will be used in the development of the Statistics Report. Unless otherwise specified in writing by the Buyer, an individual participant’s results will not be made public by Forensic Assurance. Data collected from a participant’s results will be compiled with the results of others taking the same test. A statistical assessment will be performed on the collected data with the results being released in the Statistics Report. 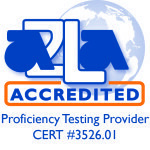 It may be required that proficiency testing results be sent directly to a laboratory’s accreditation agency. The laboratory will be asked to complete the Release of Proficiency Testing Results form and information regarding a participant’s performance will be appropriately reported to the accreditation agency. All Complaints and Appeals are to be submitted to Forensic Assurance in writing via email or US mail. Forensic Assurance will respond to all complaints and appeal requests. The Buyer of a Forensic Assurance Proficiency Test can appeal incorrect results reported in the Report of Proficiency Testing Results. All appeals are to be submitted to Forensic Assurance within 30 days of issuance of the Report of Proficiency Test Results. Appeals put forth by the participant will not be entertained without a written request submitted by the Buyer. Appeals for correct or inconclusive results will be entertained with sufficient justification from the Buyer detailing why this appeal is necessary. All proficiency testing items are requested to be maintained by The Buyer until the issuance of the Statistics Report. The Buyer may be requested to return the proficiency test items to Forensic Assurance and to provide full examination notes and materials produced by the participant during the evaluation of the proficiency test. A subject matter expert (subcontractor) will be requested to evaluate the participant’s examination notes and materials, and if deemed necessary, perform any reexamination of the proficiency testing materials to determine if and/or when a mistake was made. The proficiency test items will be returned to The Buyer upon completion of the evaluation of the proficiency test. International shipping is a flat rate of $25 for Canada and Mexico, and $80 for all other international customers. The shipping charges are assessed for each distribution regardless of the number of tests purchased for that distribution. The purchaser is responsible for all fees assessed by customs, to include taxes and duties. Should proficiency testing materials need to be returned, the Buyer is requested to contact Forensic Assurance and provide a reason for return, as well as any tracking information. Materials are to be returned to the address listed on the “Contact Us” page, and are to be returned via United States Postal Service (USPS), United Parcel Service, Inc. (UPS), Federal Express (FedEx), courier or hand delivery. Shipping costs will be paid by Forensic Assurance. Refunds will be provided when a mistake is identified in the development or design of a proficiency test. A refund will be provided in the event that an error has occurred and Forensic Assurance can not be ruled out as the source of the error. The refund will be for the cost of the individual test (excluding shipping cost), or a replacement test, and will be issued once the returned proficiency test materials are received by Forensic Assurance. Return postage is the responsibility of the Buyer. In the event that a proficiency testing item is lost or damaged prior to being received by the Buyer, Forensic Assurance will replace this item or the entire proficiency test at no cost. The Buyer is requested to contact Forensic Assurance if they do not receive their proficiency test(s) within one week of the posted distribution date. Forensic Assurance may, from time to time, subcontract various aspects of the Services. When subcontracting occurs, it will be placed with a competent subcontractor and Forensic Assurance takes full responsibility for the subcontractor’s work.